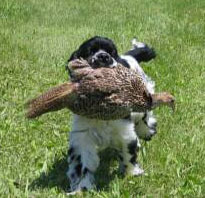 This entry was posted in Sporting Dogs and tagged choosing a spaniel for birdwork, cocker, Cocker spaniel, field dogs, field spaniel breeds, flushing spaniel breeds, flushing spaniels, hunting dog, spaniels, springer spaniel, Welsh Springer Spaniel. Bookmark the permalink. « Tips for taking totally cool dog pics!